Last night was taco night at my house. There is just something about tacos that I love. My husband will tell you that tacos at home are not as good as tacos out, but I totally disagree. Part of what I love about having tacos at home is the contrast of the hot filling with the cool toppings. I also love the contrast of textures, whether my crunch is from the shell (when we do crispy shells, which isn't often) or the lettuce. I think part of it too though is that tacos remind me of dinner as a kid. They are one of the few meals that I have brought to my marriage intact. Others, I have adapted and really, much of what I make is new to me - either stuff that my husband grew up on (he's Italian) or recipes that I have found. So, when MyBlogSpark contacted me about doing a Blog Spark for a family taco night with Old El Paso, it was a no-brainer. When it comes to eating Mexican food at home, frequently we turn to Old El Paso for our taco sauce, shells, meat seasoning mixes, refried beans and enchilada sauce, but that is only a partial list of what they offer. I was surprised to learn about all of their taco seasoning mix varieties, which includes flavors like Burrito, Cheesy Taco, Chili, Fajita, Taco, Mild Taco and even a seasoning with 40% less sodium. We generally just get the one called Taco. Through MyBlogSpark, you can print off a coupon for $.60 on 2 Old El Paso products and try some of the products for yourself. Generally, when we have a family taco night, we either use our shredded chicken, which I make in large batches and freeze or we simply brown up some ground beef or turkey (turkey mostly lately). Occasionally for a Mexican treat I will make Chipotle Chicken for my husband and the kids will have chicken I removed from the pan after cooking and before seasoning in burritos. You can put a twist on taco night, with one of the delicious recipes available from Old El Paso, like Easy Fish Tacos (this sounds so easy) or Tarantula Tacos (perfect for Halloween). And to keep your family laughing at the dinner table, you can have some fun with El Tacodor™, the world’s only family taco night game. With El Tacodor, your family can share a special night at home by challenging one another to quick fire trivia, wordplay and pantomime. Visit http://www.eltacodor.com/today to download instructions, a score card, and a challenge sheet for even more fun on family taco night! There's even a chance to put the spotlight on your family by sharing pictures of your family playing El Tacodor. For news, tips and more recipes, visit Old El Paso. You can even find a link there for a $.60/2 coupon. Thanks to MyBlogSpark and Old El Paso, I have the opportunity to giveaway to one lucky A Busy Mom of Two reader, an Old El Paso “family taco night” prize pack which includes a packet of Old El Paso Taco Seasoning, a Cactus Chip & Dip Serving dish, a set of 3 Fiesta Chili Pepper serving dishes and a $10 gift card to purchase your taco fixings. To enter: Leave a comment sharing what you do for family taco night at your house. Giveaway will remain open until October 28th at 6 pm and is open to residents of US only. Winners will be selected using Random.org random number generator. The winner will be contacted by e-mail (Please make sure that your email address is either in your comment or clearly visible on your profile or blog) and will have 48 hours to respond or a new winner may be selected. No compensation was received for this post. Through my participation in MyBlogSpark, I was able to participate in this event. 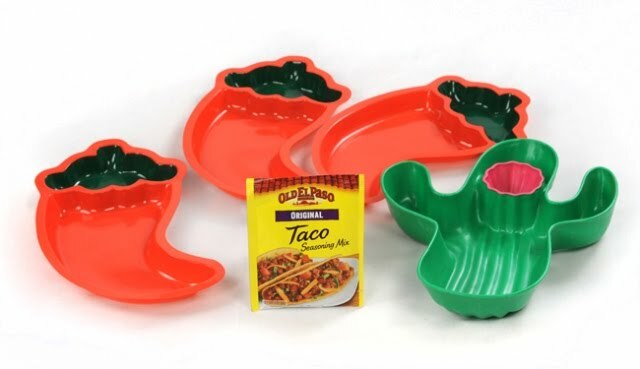 MyBlogSpark and Old El Paso provided me with a "family taco night" prize pack for me and is providing one "family taco night" prize pack for one reader. I don't have a family taco night, but it sounds like a great idea. I would play mariachi music to make it more festive. We usually make taco night a movie night as well. We usually have taco night on Friday or Saturday. Invite friends/family over and have fun with games/movies. Shared on FB@tcarolinep Jessiekatie S.
Taco Night is just like any other dinner night at our house. We sit at the table and talk about our day, and there's more time to talk since tacos are so easy to prepare! Taco night is nice because my husband and I usually cook it together--one of us will cut up and cook the chicken or beef, while the other slices up the tomatoes, avacadoes, and lettuce for toppings. Ours is more of a Taco Salad Night! We love all being able to mix up exactly what we want in our bowl! When we serve tacos, we make it special by offering all of the fixin's to satisfy all of our particular tastes. I like salmon and shrimp, dh likes beef. We usually let the kids pick their own toppings so they get only what they want. For family Taco Night, we just do the basics, but we love to have guacamole...it's our fave! Taco's are my favorite from home as well! We just eat and eat and eat!!! No lie I can eat about 5 tacos! We make our own taco bar. Taco night is one of our favorites meal nights. I set up the table with bowls of different toppings, so everyone can make their own special tacos, serve the drinks in fancy margarita glasses and we will usually play games on the wii together. We love taco night at our house! It is one of our faves! We do crunchy shells inside soft shells for a double decker! We always have family taco night buffet style - everyone likes different things, so we have rice, beans, olives, cheese, lettuce, salsa, sour cream, etc and everyone gets to make their taco soft, crunchy, nachos or a salad - however they like it! This would come in handy for us - I'm about to be on maternity leave and maybe this would help my husband with dinner!! We all sit together and enjoy each others company. WE have mexican rice and refried beans! We get lettuce, tomatoes, ground beef and beans, cheese. And kids eat them on flour shell wraps. We make a line and I let my daughter "decorate" her own taco and we have rice with it. Nothing to exciting but she loves making her own and actually being allowed to play with her food! We love taco night. We lay out all the fixings and let everyone make their own creation. We set out all the fixings and use both hard and soft shells. We are taco lovers! We love tacos and taco inspired foods! We make "regular" tacos with both crunchy and soft tortillas, and we also do taco salads, layered tostadas (flat tortillas) and nachos. I also sometimes make a all-in-one taco dish (meat, beans, rice, vegies, cheese) that we eat in a bowl with chips. We like to get everyone into the kitchen to help with the cooking. The kids love to help stir the meat and cut the toppings. For taco night, we add to the mood by playing a Mexican CD my husband and I bought on our honeymoon. We try to have Taco-movie night. We have taco night on our game night too. We let the kids make the taco when every thing is ready, they love it! We haven't had an official taco night yet - but I'd make beans and rice to go along with the tacos. We have taco night at least twice a month. Usually it involves eating tacos outside ( or inside now that it's getting colder out) and then snuggling up to watch a favorite tv episode on netflix. Its one of my favorite meals! Taco night always goes great when there's a great movie to watch!